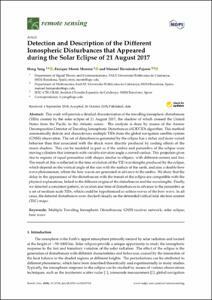 This work will provide a detailed characterization of the travelling ionospheric disturbances (TIDs) created by the solar eclipse of 21 August 2017, the shadow of which crossed the United States from the Pacific to the Atlantic ocean. The analysis is done by means of the Atomic Decomposition Detector of Traveling Ionospheric Disturbances (ADDTID) algorithm. This method automatically detects and characterizes multiple TIDs from the global navigation satellite system (GNSS) observation. The set of disturbances generated by the eclipse has a richer and more varied behavior than that associated with the shock wave directly produced by cooling effects of the moon shadow. This can be modeled in part as if the umbra and penumbra of the eclipse were moving cylinders that intersects with variable elevation angle a curved surface. This projection gives rise to regions of equal penumbra with shapes similar to ellipses, with different centers and foci. The result of this is reflected in the time evolution of the TID wavelengths produced by the eclipse, which depend on the vertical angle of the sun with the surface of the earth, and also a double bow wave phenomenon, where the bow waves are generated in advance to the umbra. We show that the delay in the appearance of the disturbances with the transit of the eclipse are compatible with the physical explanations, linked to the different origins of the disturbances and the wavelengths. Finally, we detected a consistent pattern, in location and time of disturbances in advance to the penumbra as a set of medium scale TIDs, which could be hypothesized as soliton waves of the bow wave. In all cases, the detected disturbances were checked visually on the detrended vertical total electron content (TEC) maps.